Fast on the heels of Yasmina Reza’s controversial recent hit “God of Carnage,” which tore up the stage at the Ahmanson, an equally controversial but somehow more humane work of hers receives another L.A. run, this time at The Pasadena Playhouse. The award-winning “Art” uses the fight three disparate friends have over a painting to access the base elements of human connection. It may seem to be a discussion of taste and trend. Instead its central exploration becomes what defines a friendship. Essentially, Serge (Michael O’Keefe), a reasonably well-heeled dermatologist, has bought a modern painting. 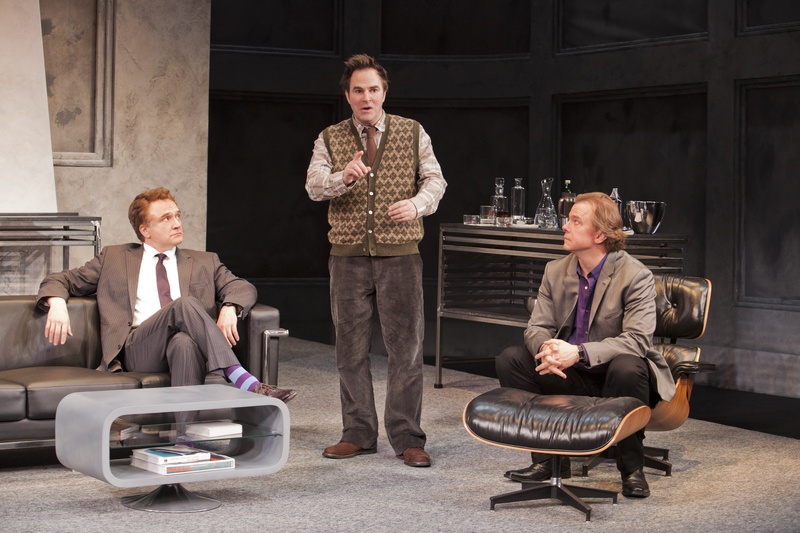 His friend Marc (Bradley Whitford), an engineer, cannot see what makes it artful. Their childhood pal Yvan (Roger Bart), a ne’er do well about to wed, is called in to find the humor in this discussion and ends up yanked first to one side and then another. In the process, truths are told, stands are made, and at least one punch is thrown. Why do they all stay in the room to discuss this? O’Keefe gives Serge, often with just a raised eyebrow, the innate pomposity of someone staunchly defending a passion: dismissive of those without the same spark. Whitford’s Marc exhibits the commitment to reason over emotion one expects of someone rooted in the provable, all with a kind of gee-whiz confidence which cannot help but make Serge frost up. Bart gives Yvan the sloppy honesty neither of the others can afford, vibrating with the air of a chastised puppy. The balance of these three performances works. None becomes the star, and the ensemble allows one to listen to the nuances within the friends’ argument. Director David Lee manages to keep the energy constant, choreographing what could occasionally become a static discussion into a consistently lively, uninterrupted tale. This is aided by Tom Buderwitz’s deceptively simple set. In short, “Art” does what Reza had become known for: strip the social veneer from supposedly civilized society to show its underlying animosity. Still, in this version there is a genuine friendship, however strained, to balance the ferocity, and considerable humor. Indeed, the central argument which sparks all the rest may be one you will continue with your companions long after the play is done. What is art anyway? Become the beholder, and see.